Awards were given during January’s General Managers’ Meeting. POET Biorefining – Caro received the 2016 award for Operational Excellence, POET Biorefining – Corning received the award for highest team participation in POET PAC. POET Biorefining – Alexandria received the award for highest annual team contributions to POET PAC. POET Biorefining – Chancellor hosted Blender Pump Appreciation Day on Jan. 2 at Total Stop and Dave’s Service in Lennox, S.D. Customers who filled up with an ethanol-blended fuel received stocking caps and a coffee traveler mug when they participated in the #poetproud social media campaign. POET employees served cookies and coffee and handed out ethanol information. 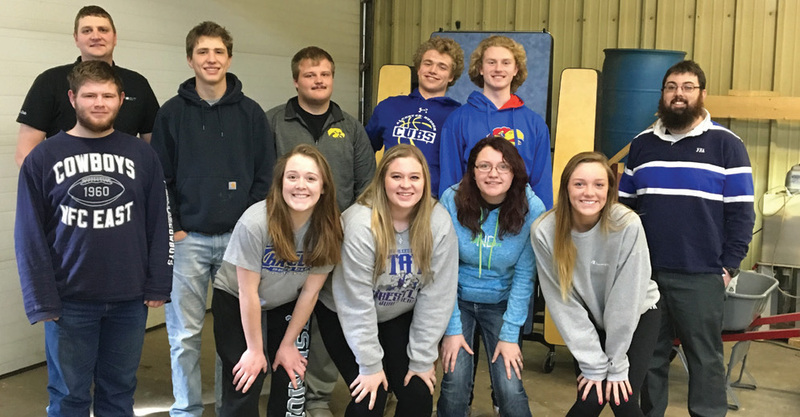 POET Biorefining – Alexandria held a Mentor Award Ceremony in February. Team members Brandon LaShure, Ryan Lindeman, Carolyn Landmann, McKennan Heald and Chris Dent have each mentored a team member since the program began in 2016. In 2016 POET Biorefining – Hudson participated in Alcester-Hudson High School District’s Youth Internship Program. This accredited class is available to qualified seniors to apply learning from their high school coursework into meaningful and relevant on-the-job experiences. Senior Brigita Rasmussen is this year’s intern. She began shadowing POET Hudson team members for three hours a week for twelve weeks in February. Brigita is interested in general agribusiness but will have the opportunity to learn about the whole company. After completing the class, students have information to make more informed career decisions. They also gain valuable insights about different career paths before pursuing degrees that may not align with their passions. For the fifth straight year, the Cerro Gordo County Farm Bureau sponsored the “Grab and Give Groceries” event to benefit the Hawkeye Harvest Food Bank in Mason City, Iowa. Twenty-three businesses participated and collected more than $6,400 of groceries to benefit the Food Bank. Teams had five minutes to collect groceries as close as possible to a $250 total. The winning team was North Iowa Credit Union with a total of $249.80! The POET team from POET Biorefining – Hanlontown decided to grab as many groceries as possible in five minutes and collected $906.44 of groceries. While the POET team didn’t win the event, the Food Bank was the real winner. POET team members Sally Moody and Sara Schoenfelder from POET Biorefining – Mitchell participated in Community Helpers Day during Catholic Schools Week in January in Mitchell, S.D. Community members set up a job fair for students and discussed their occupations. POET team members described the ethanol process and also had giveaway items for students. POET Research Center in Scotland, S.D. held its annual Chili Cook off contest on Jan. 13. Team members brought in about 15 types of chili, and local business members were invited to be judges. The winners were Greg Fix (first), Jon Podzimek (second) and Katie Kokes (third).